During the four bloody years of the American Civil War, many of the most important campaigns occurred in the West, the "heartland" of both sides. Here the formidable Union command team of Grant, Sherman, and Thomas learned their trade, ultimately dooming the Confederacy. It was here too, that the rebel Army of Tennessee poured out its blood; Zollicoffer lying dead in the rain at Mill Springs....Johnston bleeding to death in a Shiloh peach orchard....the fruitless victory at Chickamauga. Each defeat lead to bitter infighting and rapid command changes. No wonder this "Army of the Heartland" was so unsuccessful in the end. 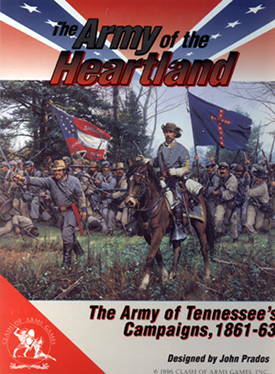 The Army of the Heartland, is a strategic-operational simulation of the rebel Army of Tennessee's campaigns during of the Civil War. Created by award-winning designer John Prados, and using the same scale and game system as his earlier Campaigns of Robert E. Lee, this game focuses on the critical, but largely ignored actions in Kentucky, Tennessee and northern Georgia between 1861 and 1863. Two stunning maps depicting the "heartland"
A 32 page rulesbook with 8 pages of charts and tables and 9 scenarios covering the major engagements. A campaign game scenario covering the whole crucial year of 1863 is also included to allow players to explore the options available to both sides.